welcomes you to her office! Dr. Bennett's dental office is located in South Fort Myers at 8900 Gladiolus Drive, just west of the Winkler Road intersection, and is convenient to residents of Fort Myers, Sanibel, Fort Myers Beach, Cape Coral, Estero, San Carlos Park, and Bonita Springs. Built in 2007, the 1,900 square-foot office features a comfortable, inviting reception room as well as five state-of-the-art treatment rooms and labs. 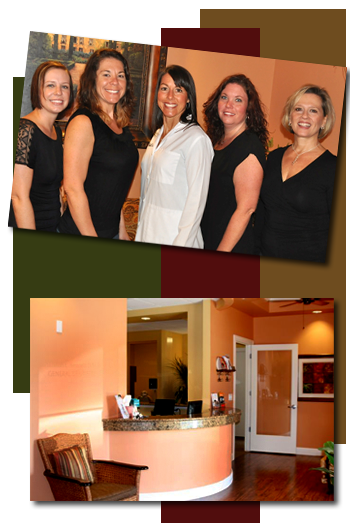 We have created an atmosphere of relaxation to give you the best experience while delivering quality dental health care. Dr. Bennett and her dedicated staff look forward to caring for your dental health with the very best tools and education that dental science has to offer — in a relaxing, comfortable setting that will help you to forget you're in a dental office. We believe that good dental health is a critical factor in your overall health and well-being. Our attention to detail not only focuses on beauty, but long-term function that is imperative to your entire well-being. We recognize that choosing a dentist is an important decision that takes time and research. We appreciate your time and we welcome the opportunity to answer any questions that you may have. Congratulations for taking the first step in restoring your mouth to an optimum state of health and beauty!